Hi, hello, sorry for the break... that head cold that I mentioned in my last post, well it's only now just left me. Two and a half weeks! So frustrating. To be honest I haven't really cooked much lately. Well that's not true. I have made some awesome salads lately with quinoa. The dressing, it deserves it's own post it was that good. But seeing as it was my first attempt at quinoa and I made the recipe up, I didn't really document it. Probably would have been wise to. Will make again I'm sure. I want to talk about Swiss Meringue Buttercream. 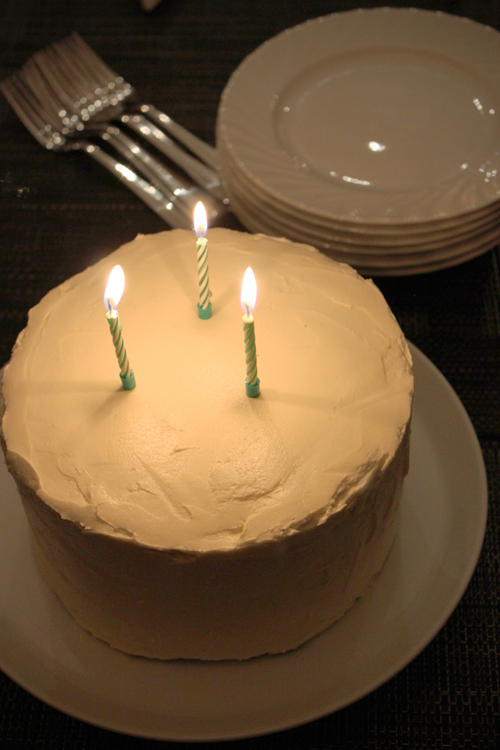 Last Friday was my brothers 30th birthday, and seeing how much he wants to appear on this blog, I put a photo of him blowing out the candle on his cake (awwwwww...). He loves a good chocolate cake. I know this. 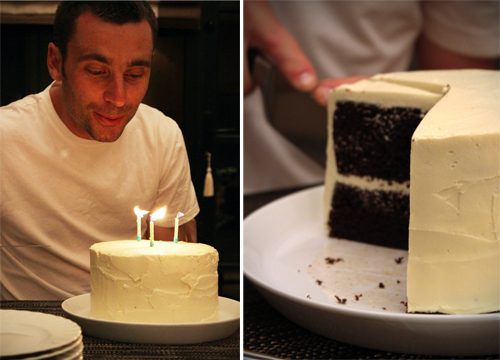 Every year he wants a chocolate cake. A couple of years ago we covered one with m&m's - I think he was maybe 26 or 27 years old. Normal. This year I wanted to do one better. 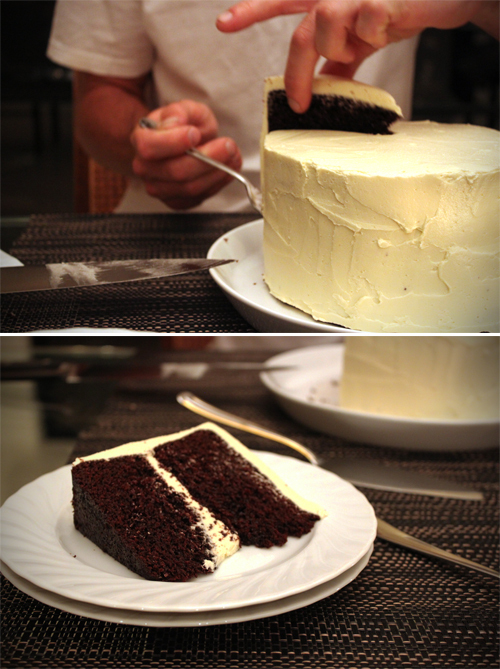 I used the chocolate cake recipe from here, but made a Swiss Meringue Buttercream = heaven!! No joke. It's so light, and semi-sweet, and it lets the chocolate cake sing! Plus the white on black looks awesome. I followed this recipe to a tee, so not going to re-write it for you cos her explanation is spot on - the quantity of egg whites and butter was perfect for this size cake. You did a beautiful job with the cake, the white on black does look great. Happy birthday to your brother! That cake is BEAUTIFUL!!! And meringue icing definitely sounds like something I could get on board with !